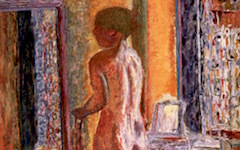 When critics discuss this painting by Bonnard they tend to discuss its flat, decorative pattern reminiscent of the Japanese woodblock prints which were then so popular. What they miss is the meaning which is by far the most interesting feature of the painting. However, when you look at it properly, knowing some of the methods that artists use in all centuries in all Western cultures, it is fairly easy to understand the true setting. As always, the first task is to look for what's odd and that leads one directly to the dog. The dog is odd. No doubt about it. Its paws are in a strange position that only a viewer focussed on pattern could explain away without meaning. What if the dog were the painter? Then, of course, you might begin to think that it was posed like the artist himself in front of the canvas, facing the canvas, with its paws painting it. 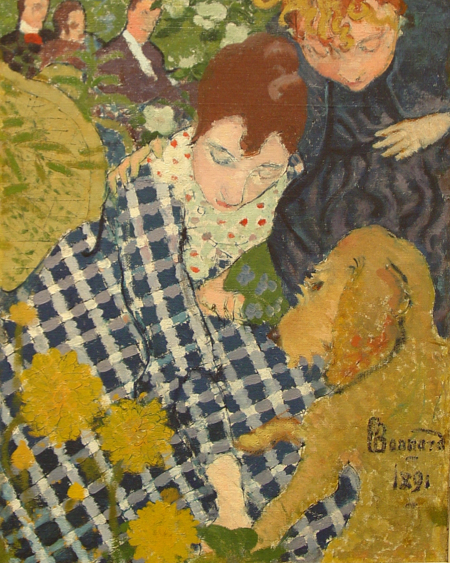 Bonnard, Women with a Dog (1891) Oil on canvas. Clark Institute, Williamstown, MA. 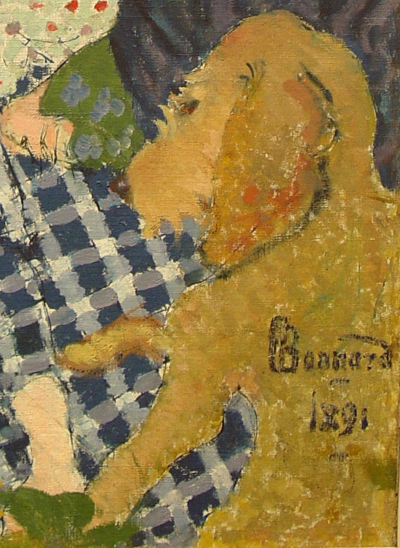 Bonnard's identification with a dog, however much it may surprise new users to this website, is not unusual at all. Many major artists have at some or other created their alter ego in an animal, just like many writers have too. Stubbs was one of them. 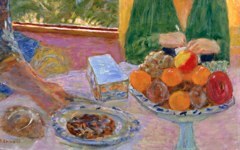 Once you know it, these types of self-representation are much easier to recognize through hints like the ones Bonnard used here. Artists use other ways of indicating their animal presence too so have fun looking for them. You will see what the experts never have. 1. 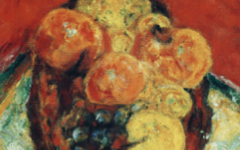 While the 'd' in Bonnard's normal signature included a bent tail, it normally extends only to the previous letter, the 'r'. Here he stretches it across several letters, all the way to the 'n', to ensure that those with the correct form of visual perception, mostly artists, will recognize his alter ego in the dog. 2. Facture is the technical term for the manner in which paint is applied: thick or thin, rough or precise, large or small brushstrokes etc. Original Publication Date on EPPH: 21 Dec 2010. © Simon Abrahams. Articles on this site are the copyright of Simon Abrahams. To use copyrighted material in print or other media for purposes beyond 'fair use', you must obtain permission from the copyright owner. Websites may link to this page without permission (please do) but may not reproduce the material on their own site without crediting Simon Abrahams and EPPH.